When it comes to corporate holiday ecards sometimes it is expected that you will go down a traditional route, presenting to your customers and contacts a recognised Christmas holiday scene such as trees, baubles and snow filled landscapes. 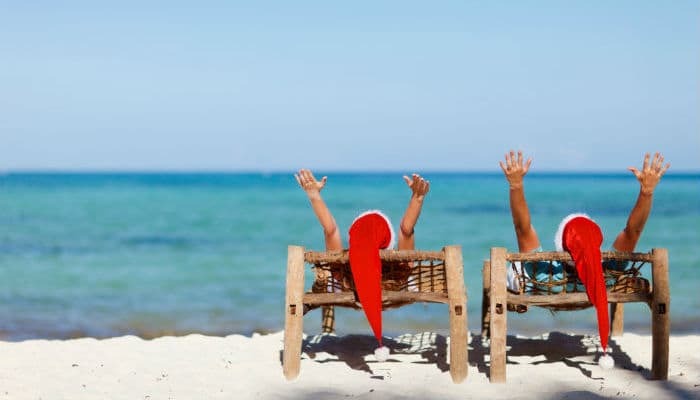 But who said that Christmas had to be about snow and winter scenes; why not approach the festive season with a bit more heat and choose to send out our Holiday in the Sun ecards instead? Perhaps you have some clients on the list who are not used to experiencing the depths of winter when Santa comes to visit them? Or maybe you just want to treat your list to some heat during the colder months. Whatever your reason our Holiday in the sun Christmas ecards for business might just have the answer that you are looking for. We really like the tongue in cheek nature of these ecards and the nod to the fun that the festive season is known to bring and we hope that you will too. As well as being a different approach to Christmas ecards Holiday in the Sun provides you with a customisable e card to send out; not only can you amend the text that will be included but you can also add in your own company logo to make sure that your brand is at the forefront of the message.